After a gallon of wine tasting with Colgin Cellars and Kermit Lynch I needed food! 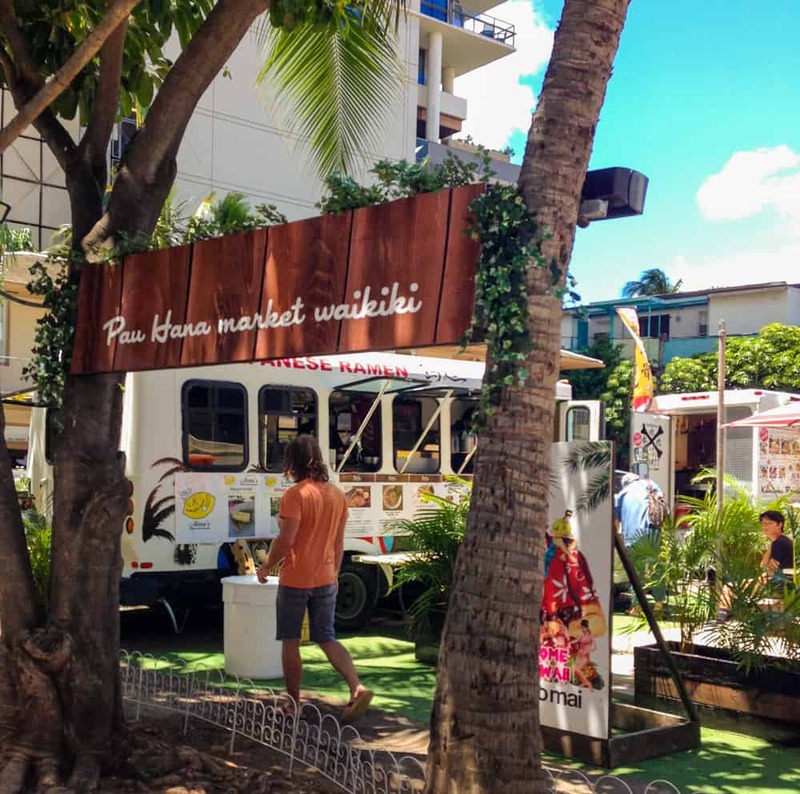 Right around the corner from the Halekulani hotel where the wine events had taken place is a new food truck area called Pau Hana Market Waikiki. Currently with seven trucks and more to come you, this food truck court offers a great way to sample the local Hawaiian food scene with ramen, loco moco and lunch plates you are right in the thick of it. I had Osaka Style Ramen from Tsurumen, but I was so hungry and loopy (I didn’t drive, I walked!) from all that wine, that I slurped it down without a photo! (I know, bad food blogging!). Osaka is the town for ramen and I didn’t get a chance to indulge when I was there, so I wanted to make up for it by trying out Tsurumen’s. 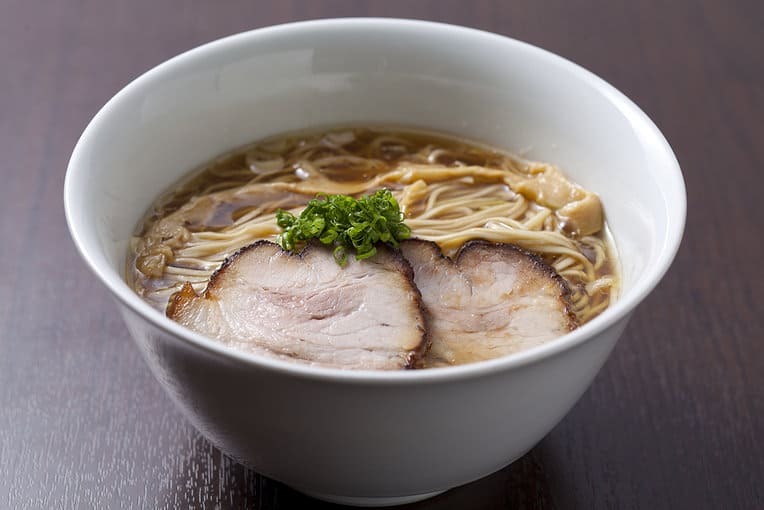 The shoyu-based broth was rich and noodles were firm with a handmade feel, it was simple and satisfying, exactly what I expect from food prepared in a food truck! Walking back to my car I noticed a long line coming out of a store next door to the Pau Hana Market Waikiki. Long line equals good food so I stopped to investigate at Henry’s Place. This complete hole in the wall is a family-run fruit stand with fresh fruit, fruit salad and juices, but what I saw everyone getting was ice cream! They are home style ice cream makers that sell hundreds of cups of ice cream every day all made with fresh ingredients and without artificial flavors. They are supposed to have great sorbet as well, but I didn’t see any the day I visited. Just look at all the flavors they offer! It’s a cash-only place, with a quick line and bad service, but I have experienced plenty of places like that, particularly in touristy areas. It was worth it once I took a bite of the pineapple-banana ice cream I purchased! I thought it was going to be an off conversation, but man was it good! The banana adds a dull sweetness to the tartness of the pineapple, so good! If you like to check out the local food truck scene when you are visiting new cities, definitely check out the Pau Hana Market Waikiki food truck court BUT save room for dessert because you do NOT want to miss ice cream from Henry’s Place! Pau Hana Market Waikiki is located at 234 Beachwalk, Beach Walk, Honolulu, Hawaii. Oddly, Henry’s Place is also listed at the same address, so you definitely can’t miss it! How about you? Do you like to try local cuisine at food trucks? 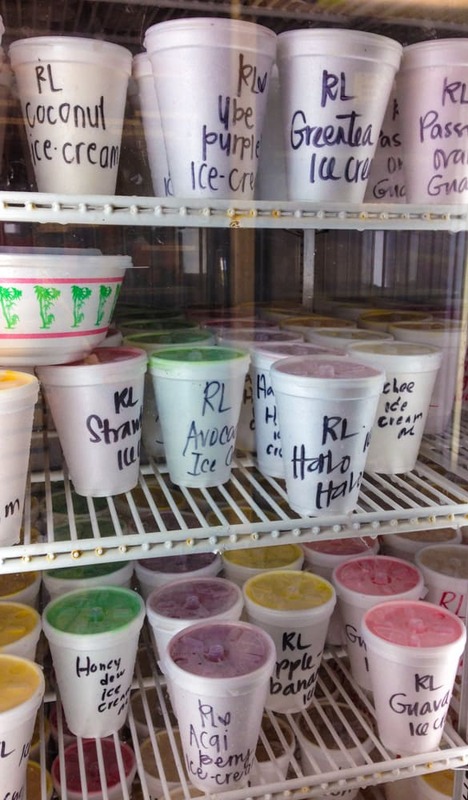 Which ice cream would you want to try at Henry’s Place? Do tell! Leave it to you to find the food trucks! Oh wow those ice cream flavors! Thank you for sharing your review. @Shannon, yes, it was so hard to choose! @Dorothy, I wish I could have tried them all, there were some I have never seen as well. Seems like I would need be there a month (or more) to try every flavor! “Long line equals good food” – Yes! I think that too!! @Jenn, right?! There has only been one time when I found that not to be the case, otherwise it is generally a good rule of thumb! I’m the same as you – I’m always looking for lines, preferably coming from a food establishment! My friends go crazy traveling with me because I’m always walking right pass the place with no line and jumping in the longest one. It sounds like you were richly rewarded for your wait! @Kelly, you and I could definitely travel together. My hubby is French and he will not wait in line for ANYTHING, so it is only when I am traveling alone or with other like-minded folks that I can check out what every one else is checking out! It looks wonderful! Made me hungry!!! @Maria, uh-oh…I hope you found some food! I love ramen, unique flavors of ice cream and food trucks. Yum!